Tom Henke’s 217 saves rank him first all-time with the Blue Jays, and his 311 career saves are 17th best all-time in the major leagues. He played eight seasons for Toronto, pitching in 446 games, winning 29, and compiling a 2.48 earned run average. He finished his career playing two seasons for the Texas Rangers and one with the boyhood favourite team, the St. Louis Cardinals. Henke also began his career with the Rangers, who drafted and signed him in 1980. On January 24, 1985, 26 years exactly from the day of this announcement, he was chosen by the Blue Jays as a free agent compensation pick. 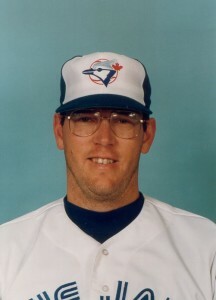 An imposing figure on the mound standing 6’5” and wearing large-rimmed glasses, Henke’s best season with the Blue Jays was 1987, when he was named to the All-Star team and led the American League with 34 saves. In 1992, his final season with the Blue Jays, he chalked up a pair of saves and pitched in three of the Blue Jays four amazing one-run victories over the Atlanta Braves, bringing home the Canada’s first World Series title. Henke, who also made the All-Star team as a Cardinal in 1995, struck out an average of 9.8 hitters per nine innings over his career.